I was surprised when my parents picked out La Hacienda for our Christmas dinner; I had been under the impression that my parents didn't much care for Mexican food. Luckily, any concerns about eating at a Mexican restaurant to celebrate the holiday they may have had were definitely squashed by the terrific experience we had at La Hacienda. First things first, my parents had made sure to note that one of our party (me!) was a gluten free eater. Almost immediately after we sat down the waiter acknowledged the dietary restriction and provided some great suggestions for me as I began to peer over the menu. It's always nice to have that guide and particularly nice when the guide isn't overwhelming, as was the case at La Hacienda. My family ordered up some chips and guacamole to begin, and I went with the "Camarones al Chipotle" after being assured that it was safe for gluten free eaters. You can check out the full menu here. The guacamole was a great way to begin, but we all way overload on the chips. The dip was prepared at the table, with the waitstaff asking us about our particular tastes in concocting it. It definitely isn't part of our Christmas routine to have guacamole, much less to have it prepared tableside! The Camarones al Chipotle was amazing. Four (perhaps five, I'm now forgetting) shrimp were served on a corn base, similar to a bruschetta but with a Latin American flavor and much thinner. So maybe not similar at all. Apologies for the poor description -- regardless of what it looked like, it was delicious. I also didn't bring my phone or camera to snap pics of this meal... guess you'll have to check it out for yourself! After eating all of that food, I had to skip dessert. It's been a few days since I had this meal, but I think I can safely say I'm still full from it! I would definitely recommend La Hacienda to anybody looking for a restaurant with gluten free options in the Scottsdale area. Big news! Well, sort of. Post Cereals just announced that two cereals, Fruity and Cocoa Pebbles, will now be marked as gluten free. The new design of the Fruity Pebbles box is featured below. I say this is "sort of" big news because Fruity Pebbles have not contained gluten for quite some time. In fact, I've been making my friends an amazing gluten free treat using Fruity Pebbles for a long time; I'll definitely post the recipe up soon! However Fruit Pebbles were never certified as gluten free, so they are now a safe option for Celiacs. I was recently contacted by Katz Gluten Free Products to try some of their new products. After having a great experience with Katz's products the first time (check out that post here), I knew I had to check out these new products. Katz sent me a box filled with their new Vanilla Rugelach and Chocolate Frosted Cupcakes along with pre-existing products including the marble cake and chocolate dipped cookies. The value of the sample pack is approximately $12. Katz makes great products, including ones that are corn free, dairy free, soy free, egg free, rice free, and/or sugar free. I absolutely love Katz's products. While I was a bit thrown off that the products must be frozen upon arrival, all of Katz's products maintain a fresh taste even after being frozen. 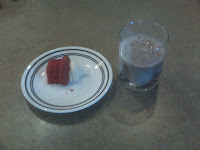 The Chocolate Frosted Cupcakes were amazing -- they weren't overly dense as many gluten free cupcakes can be. I also really enjoyed the Vanilla Rugelach. Best part -- shipping for Katz's products is free for orders over $30 until the holidays are over. Check their website here for more details. Katz is also running a holiday giveaway which will take place January 3rd, 2011. This is a HUGE giveaway. The winner will win a box filled with EVERY single product that Katz makes. That's an enormous box! To enter, click here, scroll down a bit, and fill in the information. I really can't talk highly enough about Katz's products. These are definitely some of my favorite gluten free treats -- I'll soon be placing a holiday order to help me get through the gluten-filled holidays. Oprah's favorite burger is headed to New York -- The Counter is expected to open this weekend with a new location in Times Square. Check out my previous posts on The Counter here and here. I absolutely love The Counter; it's been much too long since I've been there. They have the best sweet potato fries! Of course they also have a great listing of gluten free items on their website here. That never hurts. 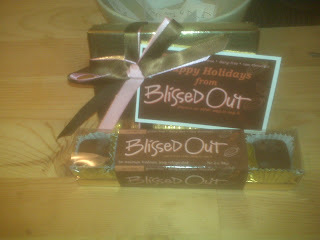 My friend Heather over at Gluten Free Freak put me in touch with her friend Erika Martin of Blissed Out Chocolates. How could I say no? The package just arrived in the mail and luckily today is a day when I went running, so I was able to indulge in (too many) chocolates. These chocolates are organic, gluten free, dairy free, and raw. But are they any good? I started out tasting the sampler package, which contained a mint, a coconut truffle, a spicy mexican, a pure bliss, a fig & pink peppercorn, and a salted almond chocolate. 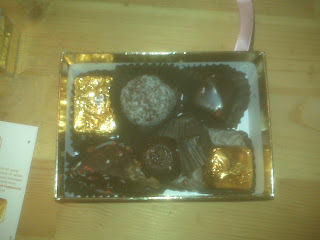 I tried the coconut truffle and the salted almond chocolate and both were amazing! I also dipped into the smaller box upfront in the top photo filled with dark and creamy organic chocolate; that chocolate was great too! I'm excited to try more of these chocolates out. They definitely have a gourmet taste about them; there is no way you can mistake these chocolates for a Hershey's chocolate bar. I'm most looking forward to the mint flavor... I figured I would hold out until tomorrow to celebrate the beginning of my Winter Break! It's crazy that I haven't blogged about Larabars yet. I'm not sure when I first started including Larabars in my diet, but ever since that day they have become a staple. Larabars are marketed as "The Original Fruit & Nut Bar." While I can't validate whether such a claim is true, I can say that I truly appreciate the company's use of mimimal ingredients. Whereas many other fruit and nut bars are filled with ingredients which I can't even pronounce, Larabars keeps it simple. My favorite flavor, Peanut Butter Cookie, has these ingredients: peanuts, dates, salt. That's it. Nothing more, nothing less. When was the last time you looked at an ingredient label and actually understood everything on the label? Perhaps the best part is that every single bar is gluten free, even ones with potentially misleading titles such as Chocolate Chip Cookie Dough. In addition to being gluten free, they are also soy free. Check out more on their gluten free information here. Larabars also has a line of bars called Jocalat. I'm a fan of the chocolate mint bar, although I've suggested it to other people and it's been overwhelmingly rejected by them. I'm a sucker for mint chocolate items (check out my previous ode to the combination here) so I love them. This line of bars also comes in chocolate, chocolate coffee, chocolate hazelnut, and chocolate cherry. I also love Larabars because the founder of the company, Lara, is a USC alum. Fight on! UPDATE (12/11/12): Just a quick update to let you San Diegans know that Snooze has a location in Hillcrest in addition to the Colorado locations. I went recently to the location in SD and it was just as good as I remember it being in Colorado. I again opted for the huevos rancheros and ordered a single gluten free peanut butter cup pancake. The pancake was mind-blowingly delicious, filled with chocolate chips and topped with homemade peanut butter and chocolate sauces. 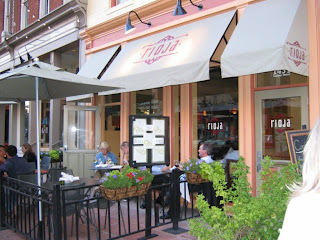 In addition to the delightful food the service was great, the restaurant has beautiful big windows and is large. There was a wait when we went but it was well worth it. The pancakes were definitely better than my last visit. I will definitely be visiting Snooze again soon here in San Diego. 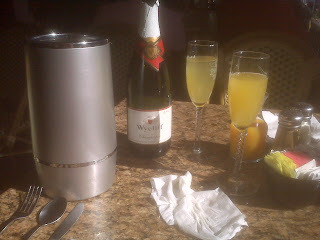 My friend Stevie and I headed to Root Down early on Sunday morning to check out the restaurant's brunch. I had neglected to visit Root Down on my previous trip to Denver because of mixed reviews; Stevie assured me that such reviews were incorrect and that we had to check this place out for brunch. Unfortunately for us, Root Down doesn't open until 10am for brunch on Sundays. He had to work beginning at 11:30am, so we decided on Snooze. My Twitter friend GlutenFreeDee had suggested Snooze to me as a place to check out and Stevie hadn't been there in a long time, so we headed over to its location over by Coors Field. Upon looking at the menu I was immediately struck by how many options were available gluten free. I stuck with my regular breakfast order of Huevos Rancheros. Ever since moving to California a little over two years ago, I've worshipped at the altar of Huevos Rancheros. I love the tortillas, the guacamole (or avocado), and the beans served on the side. Fresh avocado is something I have definitely become accustomed to on the West Coast, and it was good to see my favorite item was still being served up in the Rocky Mountains. Stevie opted for the gluten free pancakes which I was excited to try. I had originally intended to order them but once he said he was going to, I figured we should order two dishes so as not to be repetitive. I loved my huevos rancheros. No, they weren't my favorite huevos rancheros (that award goes to Mani's, where I particularly enjoy the Huevos over Blackstones), but they were tasty. Stevie's pancakes weren't as warmly received. He wasn't a very big fan of the dry pancakes. While it was of course great to be able to order gluten free pancakes from the menu, Snooze's were very dry and not particularly flavorful. Stevie ended up having to douse them in maple syrup to make the best of his meal. As he is dairy free, he stayed away from the creamy pumpkin drizzle that was served on the side. I tasted the pancakes with the drizzle and absolutely loved the flavor of the drizzle, but there was no way to escape it: the pancakes were dry. 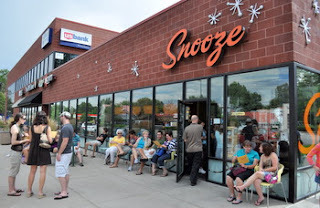 It's also worth noting that, despite the early hour (we arrived around 8:30am), Snooze was hopping. We waited about 10 minutes for our table; not at all a bad wait, but at that hour I was surprised there was even a wait. Overall, I enjoyed Snooze and appreciated that the restaurant was aware of gluten free eaters. However, I know that next time I'm in Denver I will head directly for Root Down. Third time's the charm, right? To end a great weekend of gluten free eating, Stevie and I checked out Happy Cakes Bakeshop in the Highlands neighborhood of Denver. First off, what a great area. 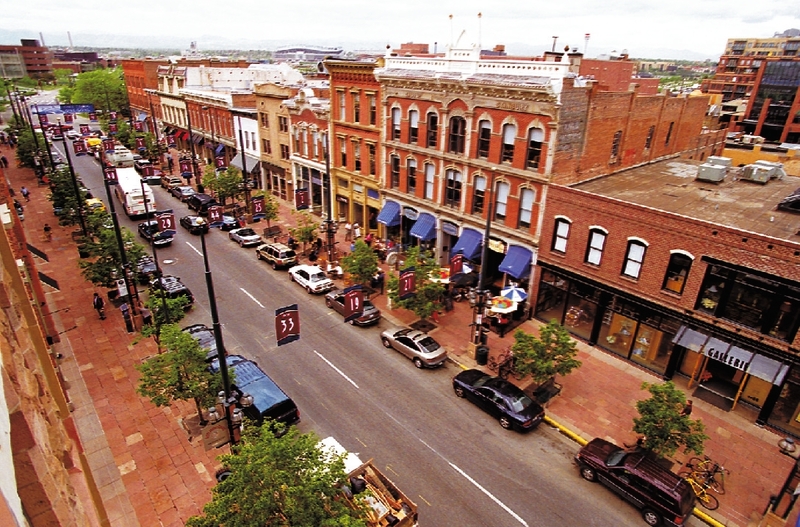 It has beautiful views of the Denver skyline, great shops, and good food. Well, that last insight comes from Stevie, as we didn't eat any of our meals in this area. We did stop into a great bookstore, however. I really wish I had taken the name of that bookstore down; if I visit Denver again it will definitely be on my list of places to visit. Oh wait, I just found it! : West Side Books. Despite having spent hours in the Tattered Cover the previous day, I'm always up for a good bookstore. I could practically smell the books as I walked into West Side Books; most if not all of the books are second-hand and the store even offers an entire section of First Edition books. I loved rifling through the bookstore to try and find interesting books that I wouldn't normally find in a corporate chain stocked with the latest bestsellers. Anyway, I've digressed from gluten free food and I know that is why you've surfed over to my page (do people still say "surfing the web" or have we retired that phrase?). Stevie suggested that we stop into Happy Cakes, a bakery in the Highlands, to see if they had any gluten free offerings. As we stepped inside we were greeted by the tantalizing scent of freshly baked cupcakes. We strode up to the counter and I immediately inquired about their gluten free offerings. We were in luck: Happy Cakes had a gluten free Red Velvet on display! The friendly woman behind the counter also offered that the macarons the bakery makes are gluten free. That particular day's macaron was vanilla with a cherry cola icing on the inside. Stevie and I both ordered up a macaron and decided to split the red velvet cupcake. We took the red velvet cupcake to go but I couldn't resist chowing down on the macaron right there in the shop. It was flaky like macarons I've had in the past and the icing was also good. Honestly, despite the fact that macarons are supposedly the new cupcakes, I just can't get into them. They are a bit too flaky for me (like the people in L.A.!). But hey, if you want to bring me back a macaron from Ladurée I won't say no. We saved the red velvet for later. I prepped for the ceremonial cupcake eating by imbibing in a delicious mix of Silk's Pure Almond Dark Chocolate Milk mixed with Silk's Pumpkin Spice flavor. It was the perfect mix. We split the cupcake in half and Stevie immediately dug in. I wanted to see his reaction before tasting mine; I was still feeling pretty full from the morning's breakfast and macaron. That photo is so sad... I really need to (a) get a new phone with a better camera and (b) take better pictures of my food for the blog. The latter will be one of my New Year's Resolutions! 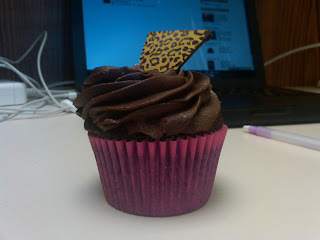 Anyway, the cupcake was delicious. The frosting was amazing. It was moist and tasted like what I remember a gluten-filled cupcake tasting like. I hope I get back to Denver again soon to check this place out! My friend Hilary picked me up a delicious treat from Cupcake Couture, a bakery in Manhattan Beach. I've been meaning to get down to Cupcake Couture since March, when my parents first recommended it to me. They visited Manhattan Beach while staying in Los Angeles and happened upon the bakery. They asked about gluten free options and were told that the bakery does normally have gluten free options in stock and can also accomodate special orders. 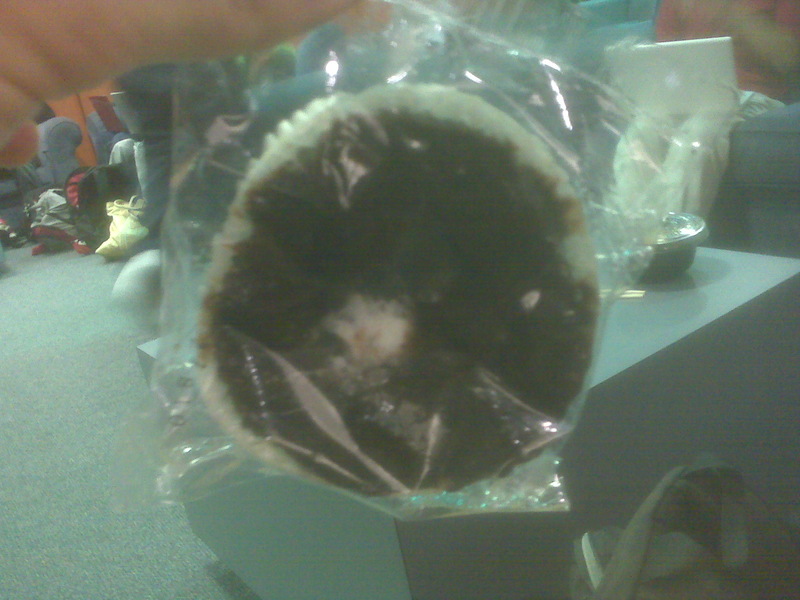 The cupcake Hilary brought me was the "Chocolate Fudge" flavor. It was out-of-this-world amazing. Even Hilary, a gluten free expert after having visited Sprinkles, Babycakes, and many other gluten free establishments, enjoyed the cupcake. It definitely tasted like what I remember a gluten-filled cupcake tasting like; fluffy, moist, and light. It was delicious. Shame on Hilary for getting me hooked on a cupcake place all the way down in Manhattan Beach. I definitely want to try the other flavors. I'll have to save future visits for 2011! 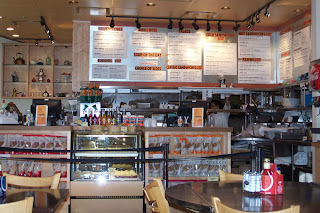 My friend Stevie and I checked out Udi's Bread Café in Stapleton the other day. I've been looking forward to trying Udi's for a long time; the company makes a lot of gluten free breads and is based in Denver, so I knew I had to do it when I was visiting the city. Stevie is also gluten free, so it was easy to convince him to check out Udi's with me. Udi's makes a great selection of gluten free food, including breads, granola, muffins, bagels and pizza crusts. I was excited to try out a sandwich fully created by a Udi's using their own gluten free bread. I had tried to make it out to Udi's the last time I was in Denver but we were on a tight schedule and didn't fit it in. I wouldn't make the same mistake twice! I ordered the eggplant sandwich, although on the menu linked in the next sentence it is listed as an eggplant panini. You can find the full menu here, which is very well-marked with gluten free options. Almost everything can be made gluten free (or is naturally gluten free). My sandwich was terrific; it was so nice to be able to walk in and order a sandwich, a rare event for a Celiac like myself. I really enjoyed the eggplant and goat cheese pairing. We also ordered a side of sweet potato fries which were delicious; they weren't the best sweet potato fries I've ever had (I think that honor is reserved for The Counter) but I still enjoyed them. If I'm in Denver again soon, I'll definitely check out Udi's again. 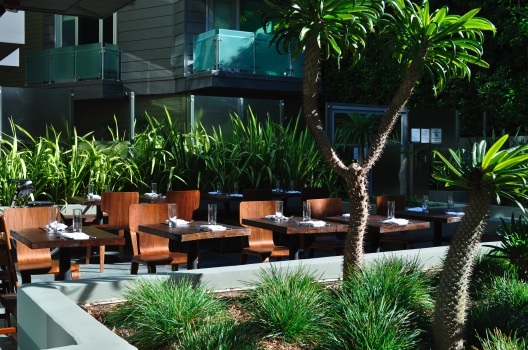 Check it out -- my friend Lauren just sent me a link to a great LA Eater article featuring Hostaria del Piccolo, a new restaurant which just opened today in Santa Monica. Eater prominently mentions that the restaurant will have a menu which conveniently labels gluten free, celiac friendly, vegan, and vegetarian options. Check out the menu here. The full Eater LA article can be found here. The above photo is also courtesy of Eater LA. Whoa -- just as I was about to post I received an UrbanDaddy blast which also advertises this place. Check the UrbanDaddy writeup here. Update: I recently had the chance to check out Hostaria del Piccolo with my friend Lauren (a different Lauren, not the one who originally recommended HdP to me). We were doing some shopping for REI down the street in "downtown" Santa Monica and decided to check it out. I've been meaning to try it for quite some time but have never made it over there. The restaurant is a very cool space; we sat at a table meant for four which had bench-like seating (so you share a bench with the person sitting at the table behind you). Our waitress was very helpful and told me that any pizza can be made gluten free for an additional $3 surcharge. At first she told me that I was only allowed to choose the option marked as "GF" on the menu, but after checking with the kitchen she changed her story -- just a heads up if you go to check it out, be persistent with your server! Anyway, Lauren and I both ordered the margherita, although Lauren ordered her pie "full of gluten" (her words!). The pie was presented beautifully; it also tasted great! The mozzarella had a very smooth texture and the added flavor of the basil made for a great pizza. The crust is a thin crust; after we finished our meal I spoke with Christian the (owner? manager?) who was very curious to hear impressions of the gluten free crust. He said that the restaurant had experimented with a thicker crust but that people told him they prefer the thinner crust. I'd prefer a thicker crust -- it's been so long since I had a thick crust because it is often difficult to make such a crust gluten free. Anyway, I really enjoyed my experience at Hostaria del Piccolo and was surprised by the personal attention we were given. The one drawback: the price! My meal came out to $21 for the pizza and no drinks. That is a lot for lunch! The life of a gluten free eater, I suppose. I wish there were more places in L.A. that sold by-the-slice gluten free pizza. I guess I'll have to get my fill from Mozzarelli's next time I'm in New York City. I'm not sure how I missed the boat on this one, but luckily I have friends like LoFo who keep me posted about great gluten free snack options. Today she brought me a bag of "Salt & Pepper Potato" flavored Pop Chips after noticing that the back of the bag listed the product as having "[N]o gluten ingredients." Instead of frying or baking the chips, Pop Chips are popped. They aren't greasy like a lot of other potato chips; instead they have a light, crisp flavor. I loved these chips! They were light, delicious, and flavorful. I particularly enjoyed how full the bag was. I know that may strange, but so often you open a bag of potato chips and the bag is 2/3 air. The bag of Pop Chips LoFo gave me was 100 calories; a great library snack. 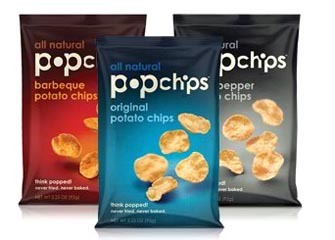 Pop Chips have no trans fat, no cholesterol, and no saturated fat. I'm definitely looking forward to trying out other flavors of Pop Chips, particularly the original potato and parmesan garlic potato flavors. Author Susan Hassett sued Elisabeth Hasselbeck in 2009, alleging that Hasselbeck had infringed Hassett's copyright by publishing her book, "The G-Free Diet: A Gluten-Free Survival Guide ," after Hassett sent a copy of her own book, "Living with Celiac Disease" to Hasselbeck to peruse. TMZ reports that the most recent suit, which was re-filed by Hassett after her original suit was dismissed based on a technicality, has also been dismissed for lack of evidence proving that Hasselbeck violated Hassett's copyright. Check out TMZ's full report here. The above photo is how I imagine Hasselbeck to the news: "I told you I didn't copy that lady's book!" Nothing better than blogging about a copyright infringement suit while studying copyright for my Intellectual Property final, right? "Elisabeth Hasselbeck -- Victory in Diet Book Debacle"
Oh. Em. Jeezy. I was just walking around my local Whole Foods and stumbled upon the most amazing discovery of my life: Silk Mint Chocolate Soy Milk. I'm a freak for anything mint chocolate; join me for a Babycakes trip and you'll see that I never leave without a Mint Brownie cupcake or check out my cart after a Trader Joe's run and you'll see it stocked with Larabar's Jocalat Mint Chocolate flavored bars. I'm obsessed. I'm in love. I didn't even hesitate in buying two cartons because I knew how much I would love it. My old roommate Vanessa first introduced me to the amazing variety of seasonal soy- and rice-milk flavors by bringing home a carton of Rice Dream Rice Nog; since then, I've been hooked on Rice Nog too. You can stock up on Rice Dream's product as it requires no refrigeration. I'll definitely make a grocery run soon and come home with 20 cartons of that stuff -- it's so good! Anyway, back to Silk's products. They also offer Pumpkin Spice and Nog seasonal flavors. While I haven't tried the Nog flavor, the Pumpkin Spice flavor is also out-of-this-world amazing. It definitely isn't an exaggeration to say that one of my favorite parts of the holiday season is all of the great seasonal food. It's terrific to see products to cater to gluten free eaters during this time of year. It's particularly nice to warm up a glass of Silk's Mint Chocolate drink on a "cold" night like tonight in West Hollywood... don't hate, you east coasters, but it's 58 degrees here and I'm freezing. My heat is on. I think I've officially transitioned from a New Yorker to an Angeleno. Uh oh. Myth: Consuming soy affects sexual orientation. Reality: There is no scientific evidence that soy consumption affects sexual orientation. I did a double-take when I read that. Do people really believe that?! Anyway... 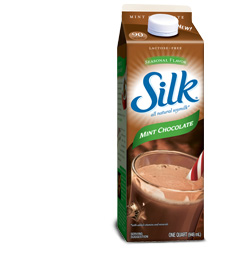 I hope you take the time out of your busy holiday schedules to pick up a carton of Silk's Mint Chocolate to test it out. My friend Caitlin sent me some information about Tatte Cookies & Cakes months ago... way back in March! Sadly I'm just now getting around to posting about it after thoroughly cleaning my e-mail inbox out. When I first looked into Tattee I remember noticing how close it was to my old stomping grounds at Boston University, where I spent two summers. I wish I had known about Tatte's then! I wish I had remembered about Tatte Cookies & Cakes before my friend Lyz's recent trip to L.A. from Boston; I definitely would have assigned her the task of bringing me some of these delectable-looking goods for me. In the meantime, all I can do is provide the link and hope that one of you checks it out and leaves a comment letting me know how it is. Right now I can only find the Pistachio Crush listed as gluten free on the shop's site, but I distinctly remember seeing more very recently when I first found the e-mail. Caitlin heard about the shop from DailyCandy on which it advertised itself as gluten free; call to inquire about other gluten free options! 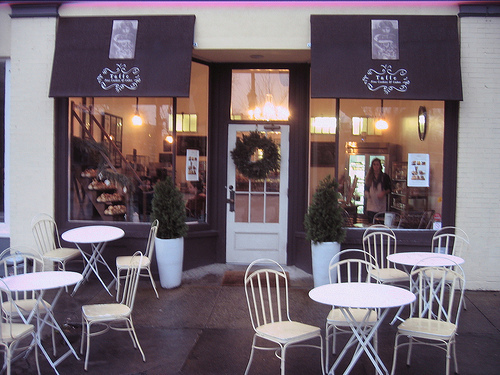 UPDATED: I reached out to Tatte's owners about the shop's gluten free options and promptly received a response. 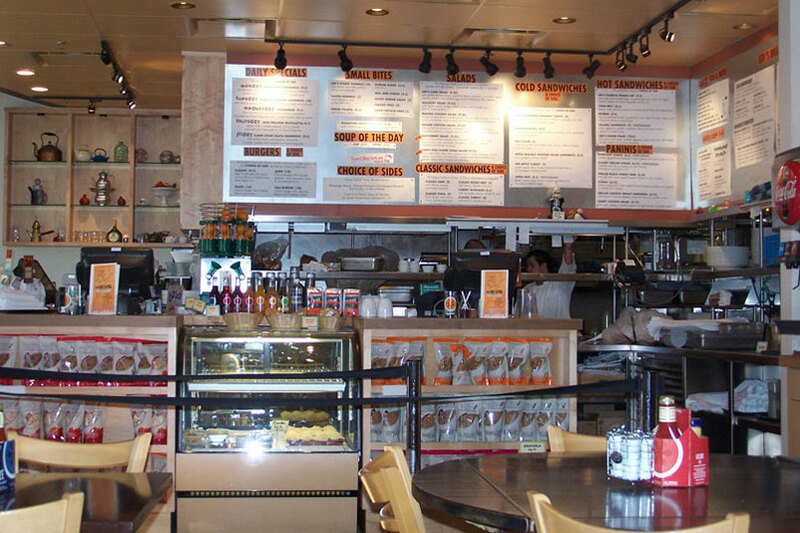 Check out all of the shop's gluten free options here -- looks like they have a lot to offer! Do you love it or do you love it? No, seriously... do you? I haven't been! Bakery on Main recently contacted me to test out their Gluten Free Gift Set, available just in time for the holiday season. 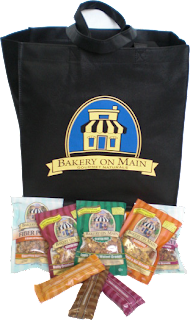 I happily obliged; I'm a longtime fan of Bakery on Main's products and was interested to see the company's gluten free holiday present set. I had never thought of a gluten free gift set as a holiday gift, but I suppose it's a popular idea. I picked up some non-gluten free treats for my friends the other day at Harry & David's... there should be options for us gluten free people too! The box is a great idea for your holiday shopping, particularly if you are gifting to college students or frequent travelers. The box comes filled with a reusable grocery bag; three gluten free granola bars in the flavors of Peanut Butter Chocolate Chip, Cranberry Maple Nut, and Extreme Trail Mix; and gluten free granola snack packs in the flavors of Apple Raisin Walnut, Nutty Cranberry Maple, Extreme Fruit & Nut, Triple Berry, and Cinnamon Raisin Flavors. All in all, it's a pretty full package! As you Celiacs out there know, traveling while gluten free is often difficult. I always bring some of Bakery on Main's products along with me while traveling in case I can't find a gluten free-friendly (and healthy) option in airports, bus stations, train stations, etc. This gift box would make for the ideal gift for your frequent traveler or for the always-on-the-go college student in your life. Bakery on Main also sent me samples of their latest product: Soft & Chewy Gluten Free Granola Bars. Before I went gluten free I was never a big fan of granola bars, but now that I am gluten free I always see people eating Odwalla or Clif bars and get jealous. If you miss eating granola bars, Bakery on Main has set out to fulfill your wishes by creating this new line. The granola bars come in three flavors: Peanut Butter & Jelly, Chocolate Almond, and Apple Cinnamon. I really enjoyed all three flavors. The bars' name is certainly not a misnomer; these bars are much chewier whereas most gluten free "granola" bars are often crunchy. I really loved these bars and will definitely be purchasing them when they hit shelves. Again, these are great products to have if you're the type of person who is frequently on the go. These bars aren't quite as filling as the granola bars featured in the gift set; they seemed to be a bit smaller. I can definitely envision myself enjoying one of these while in an airport with an Odwalla drink. My friend Henry came down from San Francisco to celebrate Thanksgiving with my friend Whitney and I. We decided to get out of L.A. and head to Palm Springs for a night; I've been there once before but Henry had never been and it's close enough to Los Angeles that it is simple to go for one night. We arrived at our hotel, checked in, and immediately headed out to Pinocchio's. Our friend Jenn originally found out about this place and it's $3.95 bottomless brunch, served until 2:30pm. Why I thought such a cheap bottomless brunch was a good idea remains a mystery... needless to say after a few bottles we were feeling just fine. Anyway, after our adventures through Palm Springs we headed back to L.A. the next day and stopped at the Desert Hills Premium Outlets. We weren't the only ones who stopped by there on this crazy shopping weekend; Lindsay Lohan made an appearance too. While at the Outlets we stopped into Harry & David to pick up some Christmas treats for our friends (and samples for ourselves). When I told the woman serving the samples about my gluten intolerance, she lead us to a dedicated gluten free section that the chain has set up. While it wasn't enormous, and mostly consisted of Glutino products, I still appreciated the sentiment. 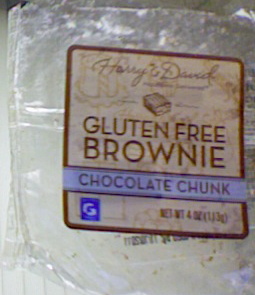 While doing another lap around the store, we stumbled upon Harry & David brand gluten free brownies and cookies! They were in the freezer section on a separate shelf from the gluten-containing items and were individually wrapped. I'm not sure why the woman didn't show them to me to begin with, but I'm glad I found them. I picked up a Chocolate Chunk brownie and a Chocolate Chunk cookie. Both were excellent! I would definitely recommend both; I preferred the Brownie even though I'm normally more of a cookie person. They may offer other individually wrapped flavors but I didn't look too closely. Next time! On the company's website there are various gluten free gift baskets available. Check 'em out here. Well I guess this means I have to book a trip to Disney World: Babycakes has just opened a new location in Downtown Disney! Sadly I won't be making it to Disney World anytime soon... the above picture is from my last trip to Disney World in January 2008. In the meantime, I'll keep you posted on Babycakes news and will hopefully update this post soon with pictures. The new shop is open from 8am to 11pm daily. You can check out what the bakery is serving up today from the location's Twitter account, here. This new location is also TOTALLY gluten free! 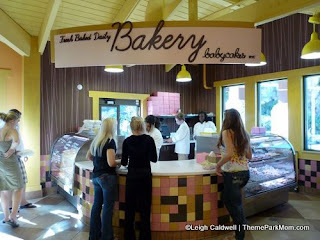 Just found my first picture of Babycakes' Disney World bakery. Check it out -- credit goes to Leigh Caldwell at themeparkmom.com. With locations in Los Angeles, New York, and now Disney World, where will Babycakes go next? I've been slacking on choosing the winner of the Bisquick Giveaway, I know I know. Life has gotten busy here in Los Angeles! I decided to employ my patentend (not really) selection method for choosing a winner. 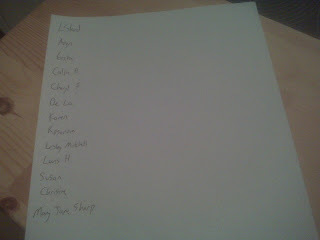 First, I wrote down every participant's name on a piece of paper. 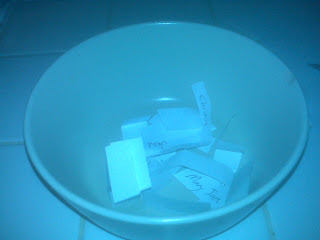 Then I cut up the names and placed them into a bowl. The color on this photo looks so strange and only further demonstrates that I need to upgrade my cell phone ASAP. Verizon, if you can hear me, PLEASE GET THE IPHONE ON YOUR NETWORK ASAP! Then I chose a winner! Congratulations LStand -- I chose your name. I'll be in touch soon about claiming your prize pack. Whoops, you didn't leave me an e-mail address. Please get in contact with me by Thursday, November 11th at 5pm. If not, I'll have to select another winner... and that is not fun. LStand's choice for what s/he would make with the Bisquick giveaway: "I would want to try the Garlic Biscuits! Being from the South I miss a good biscuit with dinner on a chilly Fall night now that I am GFree! Bet they are delicious :)." When my brother first sent me this article ("Why Philly's Gone Gaga for Gluten Free") I thought it had something to do with Lady Gaga doing a performance in Philadelphia while also adopting a gluten free diet. I know, it was a little too much to dream... oh well. Anyway, the most interesting aspect of this article were the three culprits Anthony DiMarino, director of Jefferson Hospital's new Celiac Center, identified as causes of the burgeoning prevalence of gluten sensitivity: (1) the large amount of gluten in today's diet; (2) a possible change in gluten's chemical makeup, making it harder to digest; and (3) society's germ-free obsession leading to a loss of immunity. I had never thought about the third "culprit" he identifies as a reason for the rise in gluten sensitivity, but it is an interesting thought. As people become more aware of sensitivities, particularly in children at younger ages, will we be creating more problems than we are solving by cutting out potentially sensitive food in a child's diet? What do YOU think? I know that when I was in Philadelphia I had a great, gluten free time. I checked out Sweet Freedom Bakery with my brother (amazing!) and had a delicious celebratory dinner at Buddakan. Both were amazing -- hopefully I'll get back to Philadelphia soon to check out some more of the city's gluten free options. The New York Times has just done a blog post titled "A Gluten-Free Thanksgiving." Big thanks to my sister Alyssa for sending it my way. 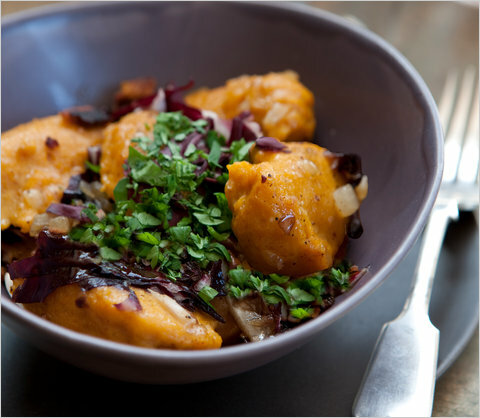 The post includes three vegetarian and gluten-free recipes by Silvana Nardone, whose son was diagnosed with gluten intolerance just weeks before Thanksgiving. Check out the post here. You can also read more of Ms. Nardone's posts here; she blogs many gluten-free recipes on that site. My friend Travis is obsessed with the website Domestic Daddy. I'm not quite there yet, but Travis will often pass me along some great recipes and today he sent along a flourless chocolate cake recipe that looks great and very simple! Check out the recipe here. I think I'm going to enlist Travis to help me make it; I particularly like the addition of cayenne pepper to make the cake unique. "Sweet Efficiency #1: Flourless Chocolate Spice Cake"
FitSugar's "Tips for Going Gluten-Free"
My friend Sarah just sent me a link to a great post on FitSugar about how best to adopt the gluten free lifestyle. Normally I don't like these posts as they offer poor guidance, but I really liked this one. I find the advice about creating a "cheat sheet" and visiting your local Whole Foods particularly useful. I think that "cheat sheet" is a great thing to carry with you as you navigate through the beginning of your gluten free diet. I remember beginning to read ingredient labels after being diagnosed and feeling overwhelmed by all of the information in this ingredient labels. After some time on the diet it becomes easier, but at first it feels like you're scaling a mountain. I also think that visiting your local Whole Foods (or natural foods grocer) is a great tip because they are more likely to have products which are certified gluten free. Of course, with products like Betty Crocker's Gluten Free Mixes and Bisquick's Gluten Free Mix on the market and in most national supermarkets, the gluten free diet has become considerably easier to navigate. My friend ACM just sent along this ABC News Report discussing the prominence of the gluten free diet. The clip features Elisabeth Hasselbeck and Dr. Peter Green of the Celiac Disease Center at Columbia University speaking about the advantages and disadvantages of a gluten free diet. It's very interesting to hear Dr. Peter Green say there are no proven benefits to the gluten free diet for those who do not have an intolerance, allergy, or sensitivity to gluten. People always assume that I'm healthier because of the gluten free diet and, while that applies to me because of my Celiac Disease, I was never sure whether it was the case. We've all seen the celebrities shilling for the diet (Rachel Weisz, Gwyneth Paltrow, etc.) some of whom may be Celiac or otherwise sensitive while others are just jumping on the gluten free bandwagon. All in all, an interesting report which ends with an interview of Erin McKenna, owner of Babycakes, a gluten free bakery with locations in New York and Los Angeles. To cap off a great weekend of eating in Denver my parents and I visited Fruition. It was a short drive from our hotel and came highly recommended; the Yelp reviews were outstanding and many people I met while in Denver suggested that we check this place out. 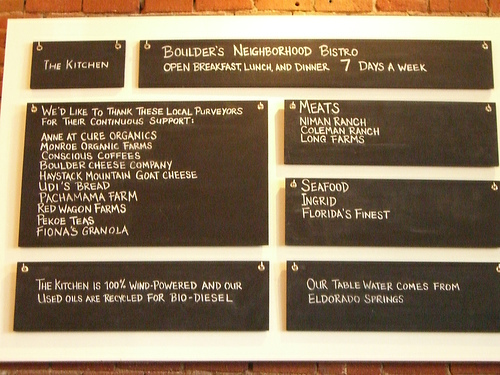 Fruition has a farm in Colorado on which it grows many of the fruits and vegetables used in the restaurant. The farm also raises chickens to produce fresh eggs for use in the restaurant. The restaurant is small and has a great ambiance. 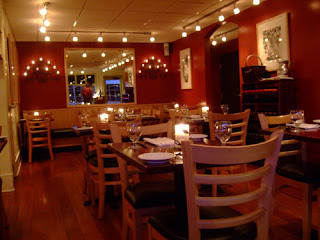 It is decorated in muted earthy colors and could definitely be a great date place. Of course, I was with my parents so... yeah. That's that. On to the most important part: the food! I ordered a roasted beet salad to begin which was absolutely divine. The waiter was super helpful in my gluten free selections and we couldn't have asked for better service. He was also knowledgeable about wine pairings and chose an excellent wine to go along with my chosen entrée of scallops with mushrooms. That being said, it doesn't take much to be more knowledgeable than me in wine. I can differentiate between red wine, white wine, and beer... and that's about it. And since I can't drink beer... you get the picture. For my main course I chose the scallops which were served with mushrooms. Another big, gluten free success. Unfortunately I'm finishing this post weeks after originally eating at Fruition, so I can't go into great detail about this entree. I've eaten too much since this dinner! Regardless of the time lapsed between enjoying the meal and writing about it, I would definitely go back to Fruition on my next trip to Denver. The service was great, my waiter was knowledgeable about gluten free options, and I enjoyed the atmosphere. This is the last of my Denver posts! Overall the trip was a great success. I was able to see friends from my hometown after years of not having seen them, make some new friends, and see a new part of the country. Denver is a great city for foodies; I appreciated that people were aware of the gluten free diet and that I did not have to jump through hoops to explain it to them. Additionally, the weather was spectacular and the feeling of space without the endless cycle of traffic was a nice break from Los Angeles. Hopefully I'll check it out again soon! Immaculate Baking Company was just what my friend Hilary and I were looking for on a recent jaunt through Whole Foods. As I've already posted about we selected some EatPastry and, much to our surprise, it wasn't the only gluten free cookie dough available. As I mentioned in the EatPastry post (here) I had never before experienced store-bought gluten free cookie dough so we were excited to try them. We picked up a package of Immaculate Baking Company's Gluten Free Chocolate Chunk Cookie Dough and headed to the checkout line. These cookies were AMAZING! They are gluten, soy, and dairy free. They came pre-formed in little balls and were really delicious. 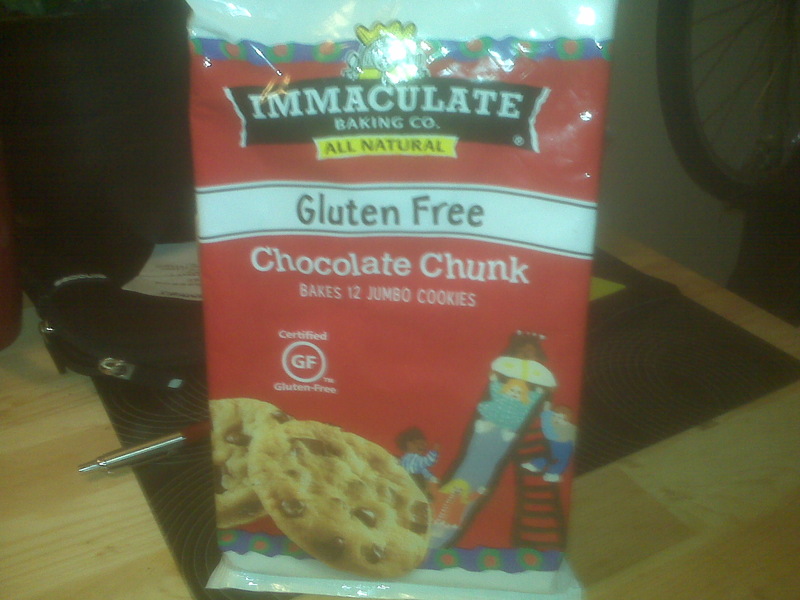 Immaculate Baking Company definitely has my vote for gluten free cookie dough. They cooked well and were delicious. Sadly my friends and I ate them before I could snap a photo! I'll be sure to update this post the next time I use this product. For photos from another blogger, check out this blog post. The only drawback? They do use eggs. Regardless, this product is amazing if you need to bake up some cookies quickly but don't have time to do the mixing. I will definitely be buying this again. There's a reason why my sister does most of the baking at home. My friend Hilary and I were perusing for Whole Foods, primarily looking for some Sharkies electrolyte gummies for my long runs, when we stumbled into her favorite section: cookie dough. I was used to having this be totally off-limits for me so you can imagine my surprise when we found a vegan, gluten free cookie dough on the shelf! 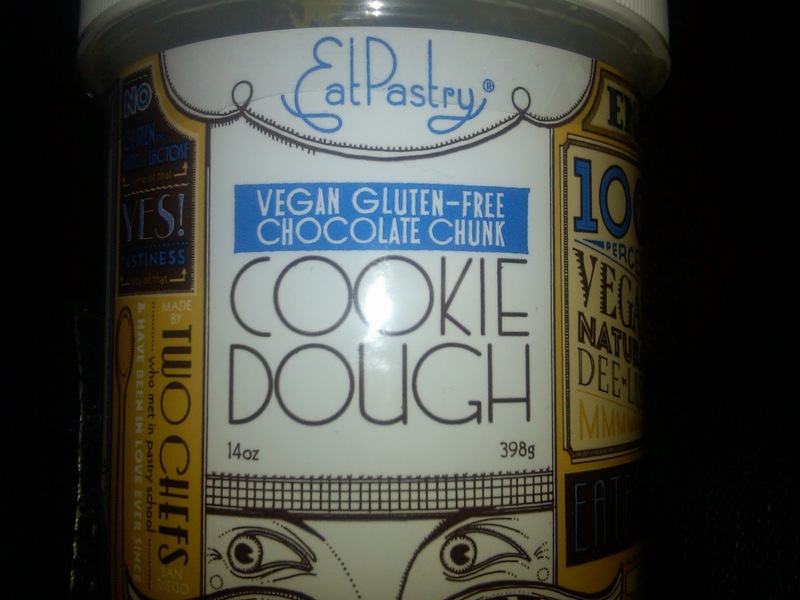 Eat Pastry is a line of vegan cookie dough; the company also makes a gluten free chocolate chunk flavor, pictured above. Hilary and I decided to give it a whirl to check it out. I had never before seen a gluten free cookie dough available on the shelves and was excited to check it out. When we went home we immediately set out to make the cookies. They were very simple to make, just as prepared cookie dough should be. We placed them on a cookie sheet (surprisingly not pink, given Hilary's assortment of pink kitchen products) and 15 minutes later the cookies were ready to come out of the oven. The cookies were good! 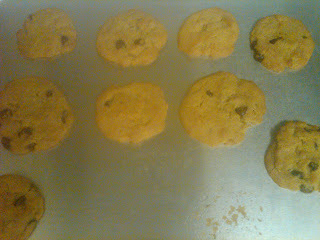 They were tasty and and not at all grainy or strangely textured, as many gluten free cookies can be. I appreciated the ease of baking them. While using a mix isn't that much more difficult, as someone who doesn't eat eggs it is sometimes frustrating to buy a dozen eggs for one simple recipe. I often experiment with applesauce as an egg replacement but haven't yet honed that to perfection. That being said, these cookies are a simple vegan and gluten-free product that can quickly prepare you for friends coming over. The cookie dough provided a good number of cookies and was very simple to form and bake on the sheet. 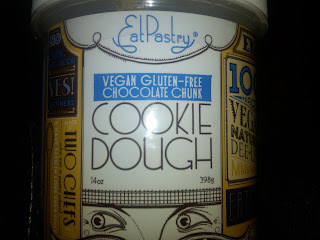 Check back soon for a post on another gluten free cookie dough mix -- Hilary and I found both in one visit to Whole Foods! I was recently contacted by MyBlogSpark about participating in a review and giveaway for my readers of Bisquick's new gluten free mix. Obviously I jumped at the opportunity! I was very excited when I received my package; it was heavier than I thought it would be when I first picked it up. When I opened it and was greeted by a cast iron pan the weight was justified. I had forgotten that they were including it in the package along with a "pancake pen" and spatula -- what a great surprise! The sample, prize pack, and giveaway were all provided by Bisquick through MyBlogSpark. Unfortunately I'm not a good cook so I enlisted the help of my friend Chris. I know, I know, pancakes aren't the most difficult item to make but isn't it true that food is better when somebody else prepares it for you? This was definitely the case with the chocolate chip pancakes that Chris and I made using the Bisquick gluten free mix. For the chocolate chips we used Ralph's brand of semi sweet chocolate chips. They were perfect because they were marked "A Gluten Free Food"! I've seen the marking on other products before but was glad to see it again. I don't do much of my shopping at Ralph's anymore because I live closer to a Pavilions so it was a pleasant surprise. The pancakes were a bit difficult to prepare; our first batch didn't come out as well as our second match. There seems to be some uneven distribution on my stove-top Sadly it is also electric so it generally is not as good as a flame, in my opinion. The pancakes didn't brown as easily as gluten-filled pancakes did, but we quickly noticed that due to the uneven distribution we had to rotate the pan along the burner. Regardless of how they cooked, Chris and I devoured the pancakes. He paid what I think is the highest compliment: "These don't taste gross or fake." I agreed that they were excellent but it's been years since I had "real" pancakes so my comparison may be a bit off. Overall, Chris and I had a great experience baking with Bisquick's gluten free mix. The mix yields a lot of silver dollar pancakes (we easily made 10 using one cup of mix and the required additions). I'm excited to test out the pancakes again on my own to see if I can replicate our success. I'm also looking forward to exploring some of the recipes on the product's website. Again, the product and giveaway were both given to me by MyBlogSpark. On that note, the contest! Check out all the different recipes Bisquick has posted using its mix here. If you were to win, which recipe would you try? 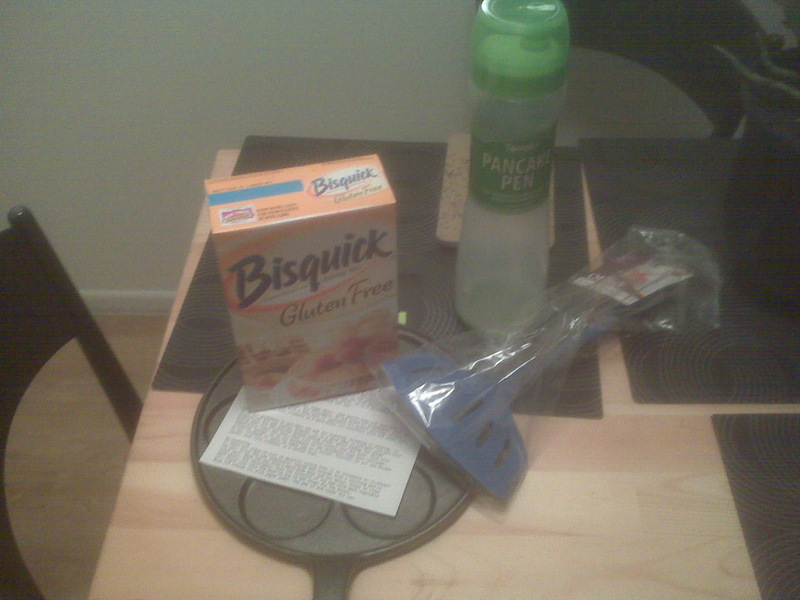 Note that the giveaway comes with a box of Bisquick's gluten free mix, a spatula, a pancake pen, and a cast iron pan -- exactly what I received and a great bundle for your pancake-making needs. Leave a comment below along with your name and e-mail address to enter. That's it! It's as simple as that. This contest will run until November 2nd at 5pm PDT. Or a warning for those who think going gluten free is a sure-fire way to improve your running. Runner's World has just written an article warning people about the dangers of going gluten free for the supposed "health benefits." It can often sap you of the complex carbohydrates, nutrients, and minerals that your body needs to run. Check out the full article here. Thanks for posting it Lindsey! I'll write a more in depth analysis of the article later. Leaving on a trip today! "Wheat Index" by Matthew G. Kadey, M.Sc., R.D. Check it out -- my friend Sarah was up in San Francisco this past weekend and brought me back some gluten free treats from Mariposa! I know the picture isn't great... in fact it is horrendous. Blame Apple's reluctance to release the iPhone on Verizon! I'm stuck with an embarrassingly outdated Blackberry. 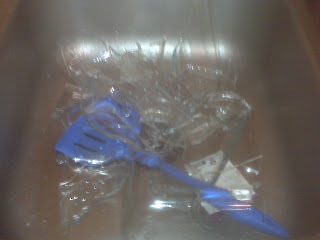 Call the waaaaambulance for me. Despite the picture, the treat was delicious! It's called a "penguino" and is gluten free and vegan. Sarah also brought me back some garlic Crostini... I'll be sampling them tonight with dinner tonight at Fritto Misto. 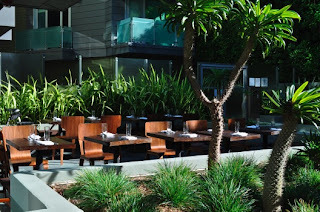 If you find yourself in San Francisco, I definitely recommend that you check out Mariposa. They have gluten free breads, desserts, and great coffe cakes available. You can also order from them if you don't live locally. After spending the day walking along Pearl Street and avoiding intermittent rain in Boulder, my parents and I went about finding a suitable restaurant for dinner. My mother came prepared with an entire list of restaurants, of course, and the one that most appealed to me was Leaf Restaurant. Multiple people recommended that we check out The Med and while it looked great, we were all looking forward to a more unique dining experience. Leaf Restaurant is entirely vegetarian. The restaurant also has a healthy serving of raw items on its menu and is extremely knowledgeable about gluten free options. The restaurant itself is small so I would certainly recommend having a reservation. Even if you don't, however, don't fear! The restaurant next door, Aji, is owned by the same person/people/entity as Leaf and when it was apparent my party of three wouldn't be seated in under an hour the friendly hostess offered to seat us in Aji while being served food from Leaf. 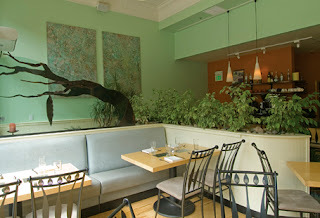 The atmospheres at Aji and Leaf are quite different; Aji has a much more vibrant color palette (suitable for its Latin American cuisine) while Leaf employs subdued earth tones in its decorations. Admittedly it was a bit strange to eat in Aji while eating Leaf's food, but it was a great option for us as we had exhausted our Boulder to-do list and were ready to eat. 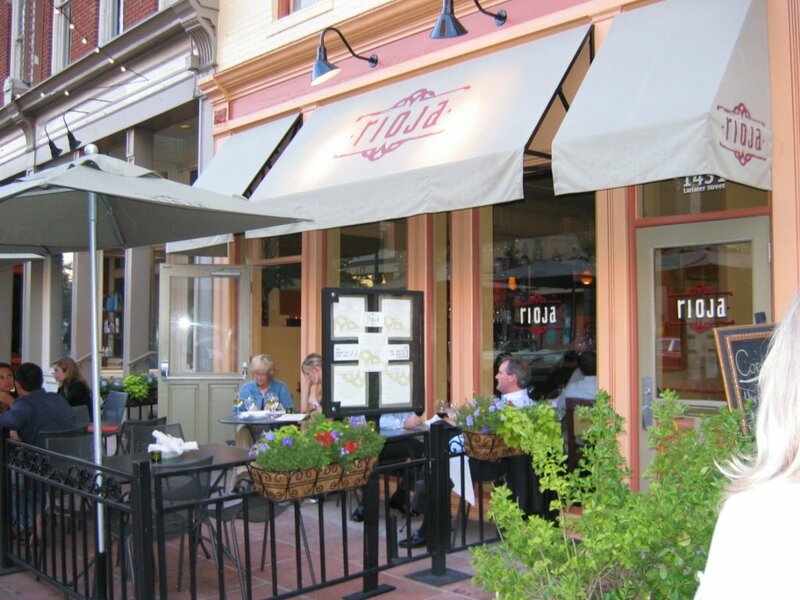 Regardless of where we sat, the food was incredible and the staff was super helpful. I ordered the raw lasagna, made with zucchini and summer squash "noodles," spinach, mushrooms, broccoli, tomatoes, marinara, and cashew ricotta. I should have taken a picture but, for some reason, resisted. The presentation was spectacular. The lasagna came out in an almost perfect square shape and looked beautiful. Of course I'm sure you're asking, "But how did it taste?!" It was magnificent. I originally didn't gravitate to this option because it mentioned "noodles;" in fact the noodles were very thinly sliced zucchini and summer squash so the dish was totally gluten free. The vegetables tasted fresh, the portion was pretty large, and the cashew ricotta was unbelievably tasty. I really could not tell that there was no dairy in the cheese. It was also used to perfection in the dish, which didn't include too much or too little of cheese. For dessert I chose the flourless chocolate cake. There isn't much to say... I didn't love the dish. It was extremely dense and not that delicious. Regardless of the disappointing dessert, I would definitely recommend Leaf Restaurant to the discerning Celiac, vegan, or vegetarian. The menu is large, the options are varied, and the food was delicious. At worst, you can always skip dessert at the restaurant and pick up your favorite dessert from the local Whole Foods. While visiting Denver my parents and I weren't content to stay exclusively in Denver. We decided to explore Boulder after hearing so many great things about the city/suburb. 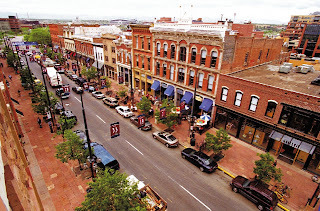 It's only a short drive away from Denver but has plenty to offer and is definitely a great idea for a day trip. Before heading into the city we took a drive through Estes Park. It was truly beautiful and really surprising that it was only one hour from Denver. 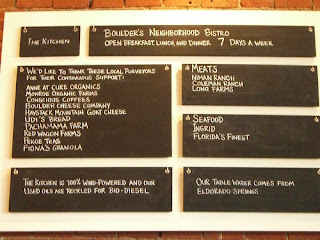 As my parents and I headed into Boulder we scrutinized our list of restaurants in the area. My mother had done extensive research into the options we had for lunch. Ultimately, we chose The Kitchen. 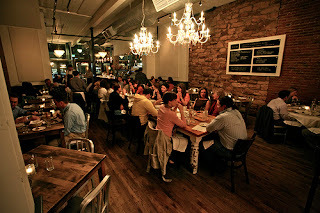 The Kitchen is a nice place on Pearl Street in Boulder, just down from the outdoor, pedestrian-only Pearl Street Mall. 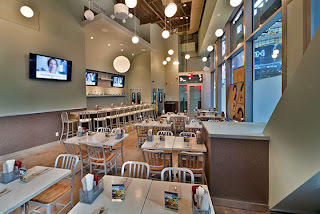 The Kitchen is a casual place with an emphasis on fresh, local ingredients. For my appetizer I did something I've never done before: ordered soup in a restaurant. I know, I know, it's crazy, but it just never appealed to me as something I would order in a restaurant. I took the plunge at The Kitchen and am glad I did -- the soup was delicious! It was a very plain tomato soup but it was great on a chilly day in Boulder. Even better than the soup was the restaurant's offer to make any sandwich gluten free! The Kitchen is stocked with Udi's gluten free bread and will serve up any of its sandwiches using Udi's gluten free bread. While I didn't opt for a sandwich (just wasn't in that kind of mood), it is great to know that the option exists. For my entrée I chose the Hazel Dell Mushrooms served with polenta, cherry tomatoes, and parsley. This dish was another incredible success. The cherry tomatoes added a great flavor to the polenta and mushrooms; I definitely think without them the dish would have been lacking. While I enjoyed the polenta, the consistency of it would not have been enough on its own. The cherry tomatoes burst with flavor when mixed with the polenta and made a great, gluten free lunch option. I don't know what it is, but I had a lot of great luck in Colorado with gluten free eating! People were friendly and knowledgeable about what was and was not gluten free friendly. Overall, The Kitchen is a place that I would love to visit again soon. My parents and I headed to Denver this past weekend; it worked out perfectly as I had a long weekend off from school and they were attending a wedding in the city. Of course meeting my parents is never as simple as that -- there's always a lot of restaurant planning included. Not that I can complain, of course, as they will foot the bill and I'll be able to eat some delicious gluten free meals. One such meal was at Rioja. The restaurant is located in Larimer Square, which isn't so much a square but a street in downtown Denver that is beautifully lit with overhanging lights. Regardless of the misnomer, it was a nice, welcoming street. During my entire trip in Denver I was shocked by how friendly the people were. It was such a nice break from the hustle and bustle of Los Angeles, where driving 3 miles can take 20 minutes (as you readers well know). Anyway, back to Rioja. The restaurant recently changed its menu and as such did not have a printed out gluten free menu available. However, they are working on creating an official gluten free menu based on the new menu and I was assured it would be available soon. Despite not having the typed out menu, my waiter was extremely helpful in guiding me through gluten free options on the menu. 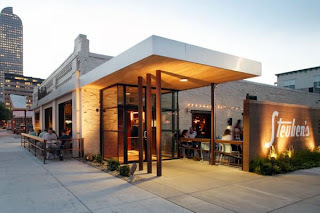 The chef at Rioja, Jennifer Jasinski, was also just named Denver Chef of the Year by Denver Magazine. I ordered the roasted organic beets salad and the grilled Tasman King Salmon. I absolutely loved the beets salad, which was beautifully presented and had a rich, fresh flavor to it. But writing this days later, I can really only focus on the salmon. The salmon was fantastic, unbelievable, wonderful, over-the-top magnificent. Living in California has made me into an avocado lover, and the chefs at Rioja did justice to the versatility of avocado. The avocado purée which came with the salmon was not overwhelming and in no way came off as a guacamole rip-off, as other avocado purées I've sampled in the past have. When paired with the salmon the purée was fantastic; add to that a grilled avocado on the side and you have a healthy, filling plate with robust flavor. I couldn't resister dessert. It was my first night in Denver and, when presented with the options, I knew I had to take advantage of my parents' generosity. The online dessert menu has not yet been updated, but I can tell you that this dessert was breathtaking. It was a peanut butter and jelly creation but not like you would expect. Instead, the "jelly" of the dish came in the form of sorbet, and the "peanut butter" came in cube-shaped chunks of (frozen? chilled?) peanut butter topped with peanuts. Whoever created this dish was a master. It was amazing! I'm sad that I didn't take pictures... but load the restaurant's website here and let the pictures play for you for a moment. They may tease you, but hopefully they will convince you it's time to make a trip to Colorado! I wholeheartedly recommend Rioja for gluten free eaters as they were very aware of our options and also very accommodating. Just as importantly, the food is fresh, delicious, and beautifully presented.